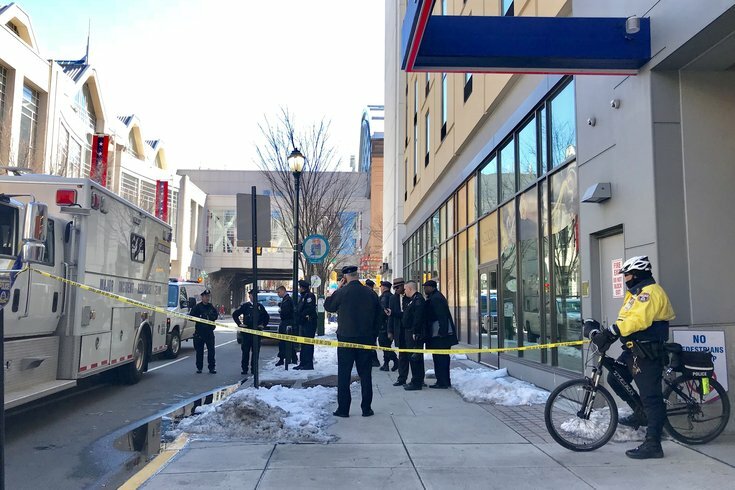 Philadelphia police were called to 12th and Arch streets in Center City after at least one witness reportedly saw two men climb through a sidewalk grate below ground and then re-emerge about 20 minutes later. This reportedly happened in the early morning hours of Friday. An investigation did not find any suspicious activity, police said. An investigation is underway after two men were seen entering an underground grate near the Pennsylvania Convention Center early Friday morning, Philadelphia police said. According to police, employees of the nearby Home2 Suites Hotel saw two men exit a Toyota and enter a sidewalk grate along 12th Street around 1 a.m. The men emerged about 25 minutes later and left the scene in the same car. Both men reportedly were white, appeared to be in their 30s and wore brown jackets. The area of Arch Street between 11th and 13th streets was temporarily blocked off as police investigated, though it began reopening around 11 a.m.
A police search did not find anything in the area. While searching the area, police identified an unmarked bag. Deirdre Childress Hopkins, the strategic communications manager for the Pennsylvania Convention Center, told PhillyVoice the situation did not impact the massive building. "I think that's been cleared," Hopkins said. "It's off our property. It hasn't been a situation for us. We coordinated with the police. We monitored it closely." The convention center did not need to evacuate or take any precautionary actions, she said.